Mayhem! Destruction! Panic in the streets! All of Manhattan is in peril as two amazons of unparalleled power duke it out in the streets! 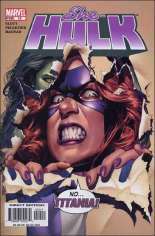 It's TITANIA vs. the SHE-HULK in their biggest grudge match EVER! And even if Jennifer can make it out in one piecee will she be strong enough to deal with the SECRET that REED RICHARDS has been keeping from her all these years? Special guest star DOC SAMSON drops by to help with some gamma-powered emotional baggage. Published March, 2005 (Modern Age) by Marvel Comics and went on sale in 2005 for $2.99 USD. This issue contains 32 pages in Color, the current NM value is $3.00 USD. The publisher has rated this issue Marvel PSR (12+).